Dan Gillmor doing an inspiring speech about the citizen journalism movement. Two great conference days in lovely Copenhagen at Reboot10. It was an inspiring event with a great crowd, but my focus here will be on the conference format and organisation, adding to my previous posts on how to organise internet-focused conferences. 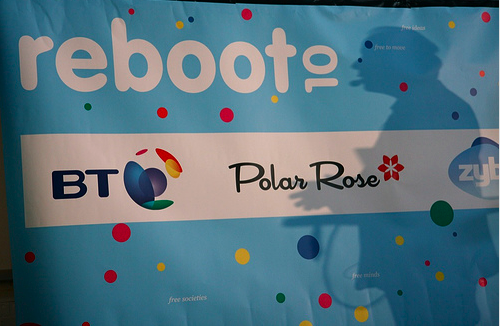 Reboot is a very different type of conference compared to for example SIME in Sweden and LeWeb in Paris. Reboot is much simpler and more improvised, taking place in a public sports hall. The Reboot website is one of the worst conference sites I have ever seen, confusing and very hard to navigate and lacking even very basic information. But Reboot more than compensates for this with lots of Danish charm and very warm reception by the energetic staff. One very smart move was to organise a free boat sightseeing tour for all the attendees the evening before the event. We cruised around the canals, sipping free sparkling wine and landed on a very cosy open air bar/restaurant. Great networking and setting a good mood for the event! See my photos. The focus at Reboot is less about internet business opportunities and more about trend watching in all possible directions combined with broadening the mind on social and other issues. I like it as an alternative to all the business idea and startup conferences I am attending! One thing about Reboot that struck me as strange was, considering theÂ youthful and non-traditional setup, that the speaker selection suffered from the same syndrome as most other business internet conferences: all white, all males, many Americans. All the male, white Americans speaking at Reboot had interesting things to convey, but especially Reboot would benefit from more women on stage and more speakers of different ages and multinational backgrounds. As Nicholas Negroponte says: “Creativity comes from difference!“. Reboot should also be more interactive and participatory. There was no interaction or forums with attendees on the web site, the moderators did not use the backchannels to get feedback from the audience and Q & As were forbidden during the sessions. Internet today is about collaboration, sharing, and creating value and knowledge together. This conference should reflect that not only in the content of the speeches but in the way it is organised. But in summary: Reboot was great and I hope to see you all there again next year! See also my other Reboot pictures at Flickr. Previous Previous post: Steve Jobs is wrong! Next Next post: Voice-to-text is the next video killer app!